Every time we drive into the Okanagan Valley we fall in love all over again. Kelowna is one of the top destinations in Canada for anyone wanting to get away, and is even more so the best destination for Canadian weddings. Photographers David & Sherry are experts in capturing the beautiful wineries, golf courses, and landscapes of destination B.C. We love the different variety of venues the city has to offer such as CedarCreek Estate Winery, Summerhill Pyramid Winery, Lindon House, Hillcrest Farm, Hotel El Dorado, Sanctuary Gardens, Crescendo, Predator Ridge, Sparkling Hill Winery, and the Harvest Golf Club as it allows us as photographers to capture the beautiful vineyards and mountainous landscapes that the city surrounding Lake Okanagan has to offer. 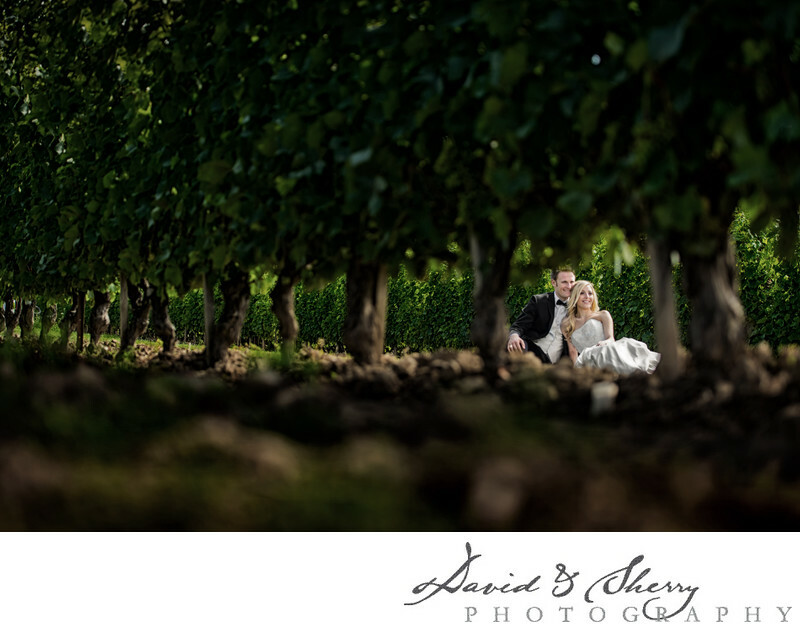 In this particular photo we are using one of the many grape vines as a leading line to our subject, a beautiful bride and groom who are being lit by the warm British Columbia sun during their summer wedding at a Kelowna vineyard. We are always looking for unique and interesting angles from which to take pictures that will allow our couple to look their best on their most important big day. We can't wait to photograph your, and what we consider the best wedding, and give you one less thing to worry about in your planning.